Embattled New Haven police Lt. Ray Tennant went from the hospital psychiatric ward Tuesday directly to court to face charges of beating his wife. He's also accused of holding his wife and their children hostage in their Tolli Terrace home for eight days. A prosecutor read a list of allegations to the judge, including claims he "assaulted his wife with a Lysol can causing her a swollen right eye." 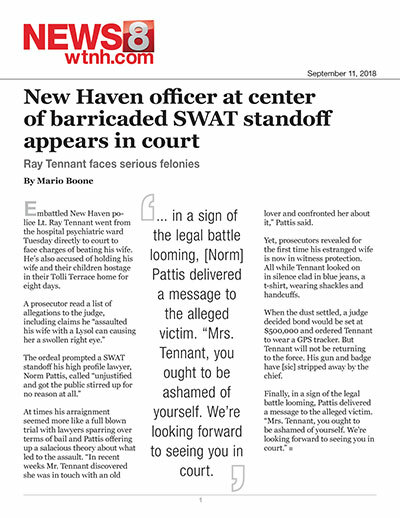 The ordeal prompted a SWAT standoff his high profile lawyer, Norm Pattis, called "unjustified and got the public stirred up for no reason at all." At times his arraignment seemed more like a full blown trial with lawyers sparring over terms of bail and Pattis offering up a salacious theory about what led to the assault. "In recent weeks Mr. Tennant discovered she was in touch with an old lover and confronted her about it," Pattis said. Yet, prosecutors revealed for the first time his estranged wife is now in witness protection. All while Tennant looked on in silence clad in blue jeans, a t-shirt, wearing shackles and handcuffs. When the dust settled, a judge decided bond would be set at $500,000 and ordered Tennant to wear a GPS tracker. But Tennant will not be returning to the force. His gun and badge have stripped away by the chief. Finally, in a sign of the legal battle looming, Pattis delivered a message to the alleged victim. "Mrs. Tennant, you ought to be ashamed of yourself. We're looking forward to seeing you in court."